You can tell from all the smiles that interviewing Hiroshi during High Point Market was great fun. Minimalism: it is a hallmark of the Japanese design and poetic aesthetic. “It is night: imagine, if you will, a path leading to a hut lost in a wildly growing arbor, shaded by the basho, a wide-leafed banana tree rare to Japan. A sliding door opens: an eager-eyed man in monk’s robes steps out, surveys his shadowy thicket and the purple outline of a distant mountain…” So begins Lucien Stryk’s introduction to On Love and Barley: Haiku of Basho, his depiction of the first great haiku poet—who would later change his name to Basho in honor of the tree given him by a disciple—as lush as the poet’s minimalistic verse. There was an equivalent in the Currey & Company showroom during High Point Market last month that I can’t wait to share with you! 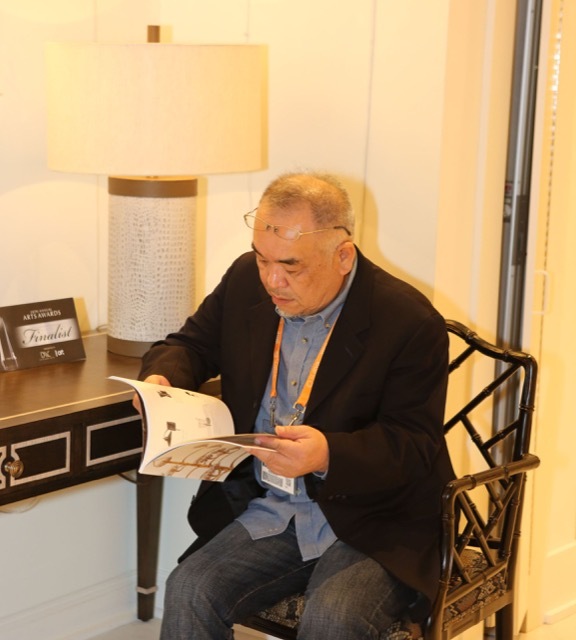 Hiroshi Koshitaka takes a break from greeting fans to look through Currey & Company’s new releases. Though the very idea of a lush minimalism seems oxymoronic, Basho’s poems and the designs I saw by Hiroshi Koshitaka, which launched during High Point, prove the two can exist hand-in-hand. Koshitaka, a Japanese designer, presented a number of fixtures that have both natural references and pared-down lines, the twin attributes ubiquitous in his home country’s writing and design. 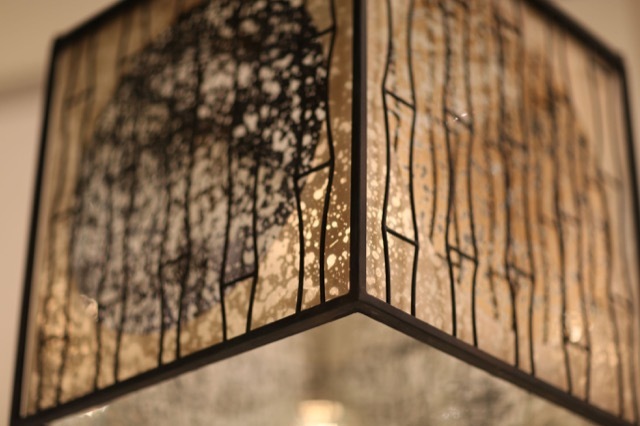 The Kiyamacki lantern with its crosshatched lines running across its translucent panels is a veritable haiku of design. 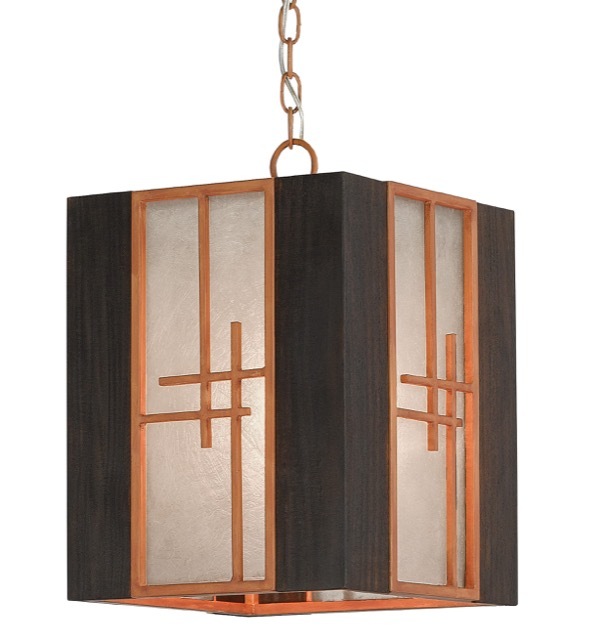 The Tsukiyo pendant is subtly ornamented with the shape of bamboo stems. “How can an attentive soul not be drawn in by nature?” Hiroshi asked when I interviewed him during Market. “After all, outside nearly every window is stand upon stand of bamboo!” He is excited about his first new releases for Currey & Company in 17 years, his sights already set on the new items he is designing to be released next Spring. 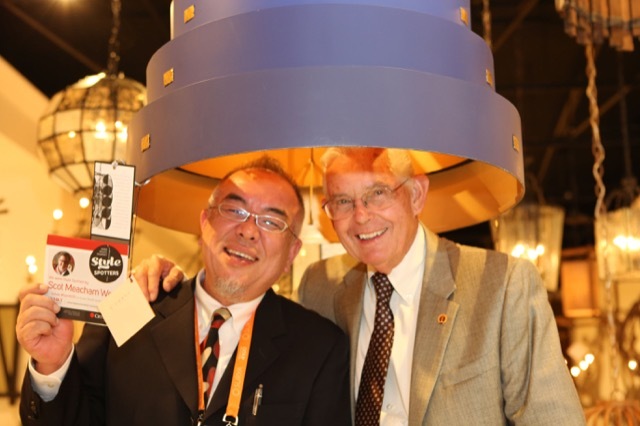 Hiroshi and Robert celebrate a Style-Spotter nod from Scot Meacham Wood beneath his Graduation chandelier, which was inspired by antique wooden nesting boxes. 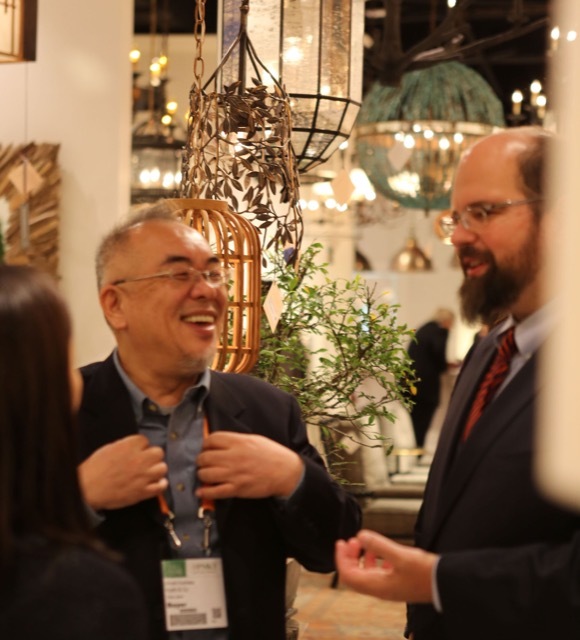 Hiroshi and Brownlee share a lighthearted moment during High Point Market. 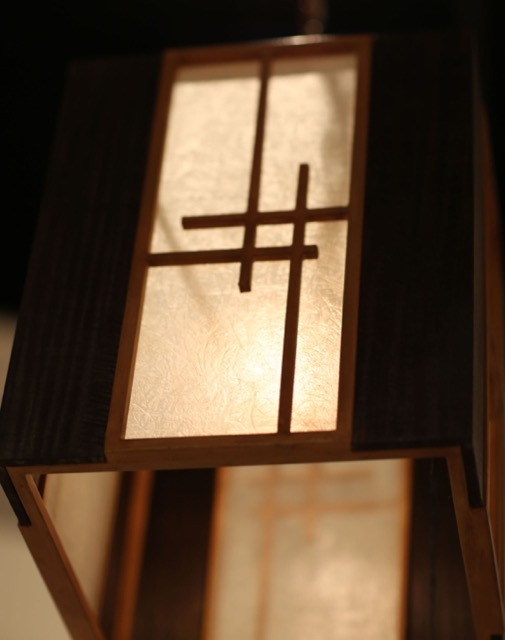 A beauty shot of the Kiyamacki lantern designed by Hiroshi Koshitaka for Currey & Company. The march of bamboo beyond the window is captured beautifully in the Tsukiyo pendant by Hiroshi Koshitaka for Currey & Company. I encourage you to take a few meditative moments and experience more of his poetic compositions in the video below before we launch into the other highlights from High Point. 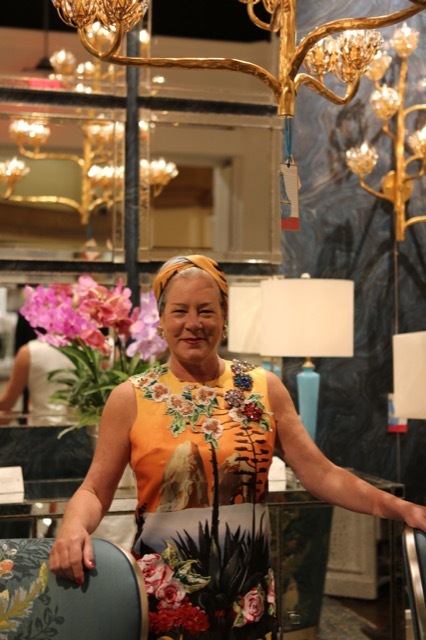 Having Marjorie Skouras hold court in the showroom during Market created such a vivacious vibe—she was like Basho’s butterfly, drawing people to her in the most natural way. Isn’t it easy to see why given the above image of her in the lovely ensemble she’s wearing standing beneath the Agave Americana chandelier? This was one of our best sellers during Market, as was the Agave Americana wall sconce. 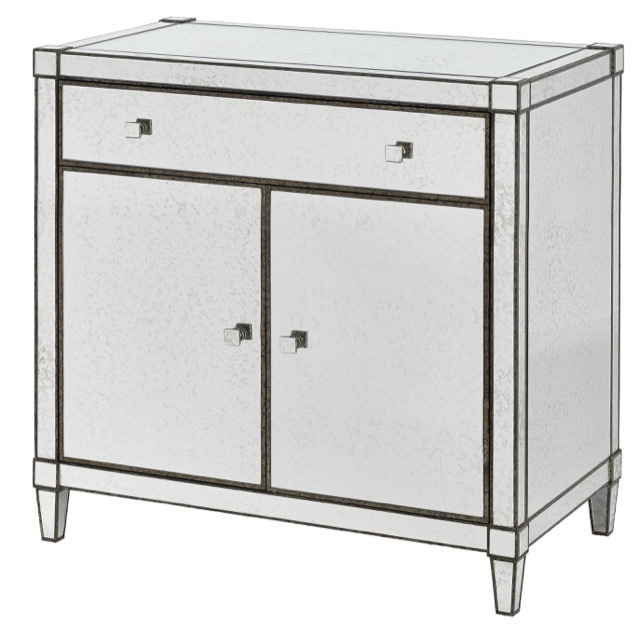 The Monarch three-drawer chest was also a best seller during High Point Market. The Monarch three-drawer chest was also one of the best sellers during Market; and of our popular products released in new finishes, the Gingko wall sconce below in distressed silver leaf was a big hit. 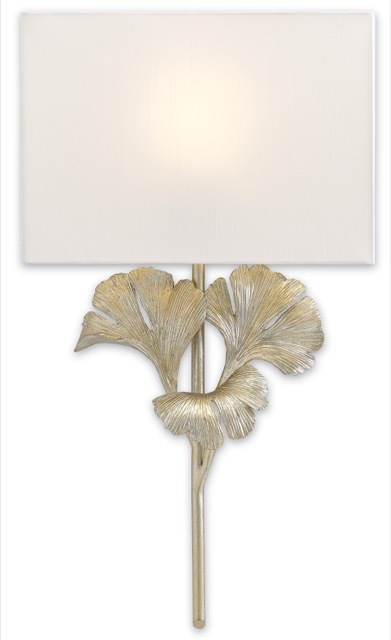 The Gingko Wall Sconce in a distressed silver leaf. 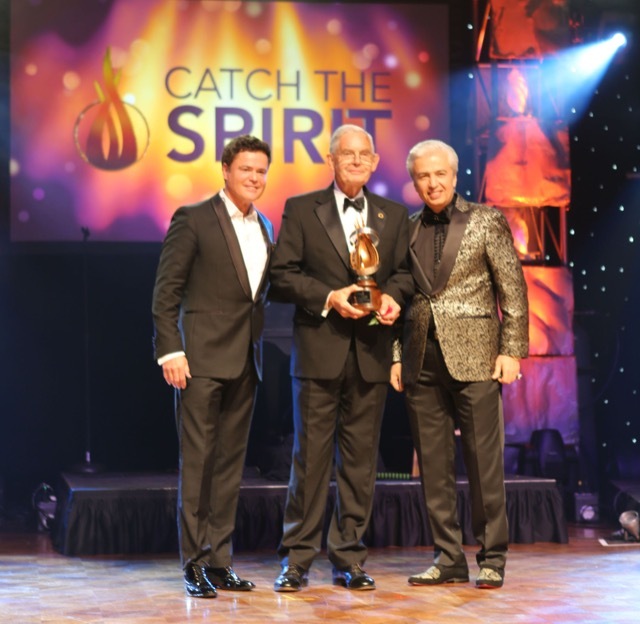 Robert Currey with Donny Osmond and Michael Amini. Did you hear the news that Robert Currey was inducted into the American Home Furnishings Hall of Fame during a star-studded vent on October 22nd? 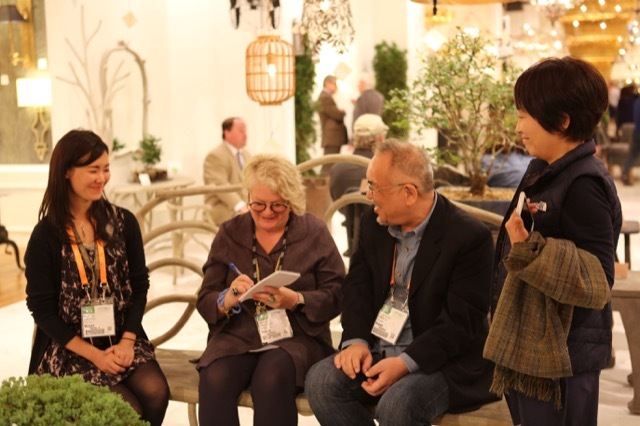 There were four other inductees that evening, each chosen for their contributions to the growth and development of the home furnishings industry in America. As you can see from the above photo with Donny Osmond and Michael Amini, there was buoyant spirit aplenty during the fête. James Swan produced a “Designer on the Street” series during Market. James Swan added a shot of adrenaline to the showroom activities during the afternoons when he held his “Designer on the Street” podcasts. 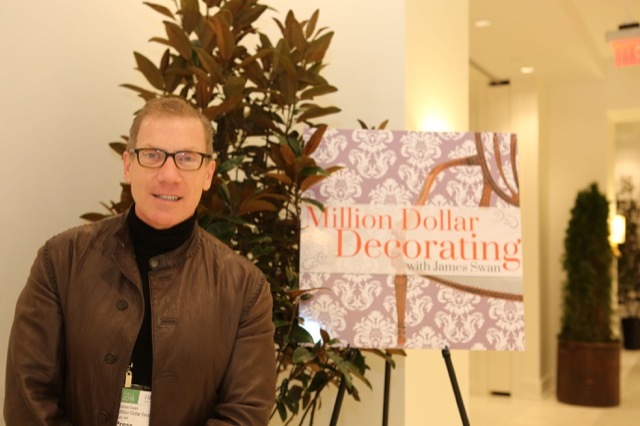 The founder of Million Dollar Decorating provided some of the most intelligent entertainment to date in the showroom, and you all know we’re pretty darned smart as a general rule! 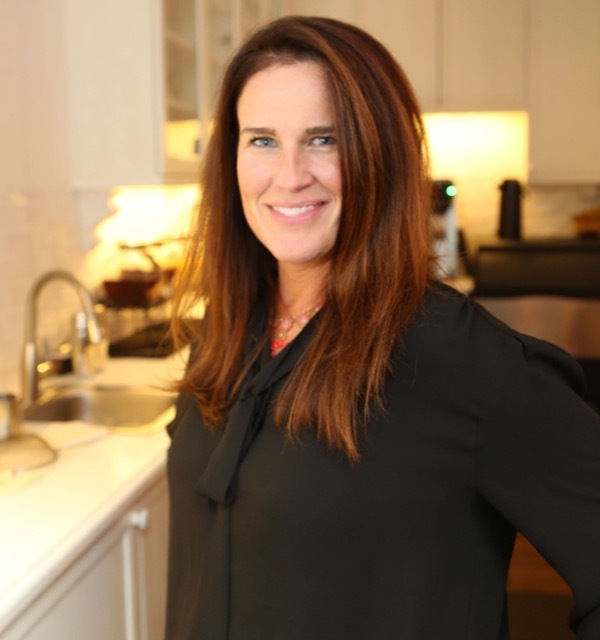 Anna Thrower and her team produce mouth-watering delicacies. 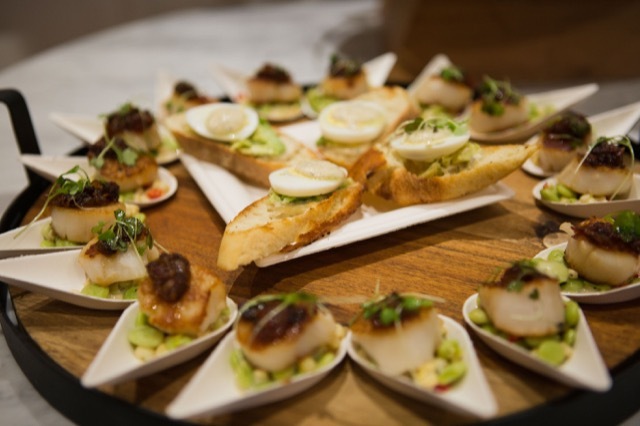 And it wouldn’t be a proper look-back at our High Point highs if we didn’t mention the fabulous food prepared by Anna Thrower and her team, though no one would accuse her of producing minimalism in her gastronomic artistry. One delicacy was captured so beautifully above by our resident photographer Beth Tilley Green. I loved coming across this image in the Market coverage photos because someone turned the tables on the effervescent young woman by snapping this shot of her. She is responsible for all of the beautiful photos taken during Market that you see in this post. Beth Tilley Green brightens the showroom with her smile and her lenses. The Potterton Pop-Up Shop was as resounding a success as it was in April so we round out this review of all things HP by saluting Clare Jameson and her sidekick Simon Barton for wowing the crowd with their knowledge of design and architectural literature. I’m ending with a bit of a tease with the photo below of Clare with none other than Bunny Williams, who will be debuting a collection with Currey & Company this coming spring. Well, it looks like that’s a wrap, design-o-philes; we hope you had as much fun as we did exploring the minimalism to come! 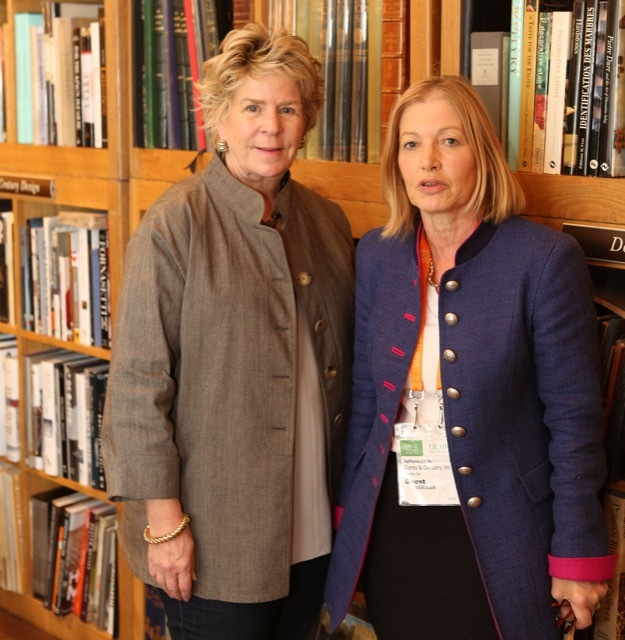 Bunny Williams and Clare Jameson strike a pose in our showroom during Market. 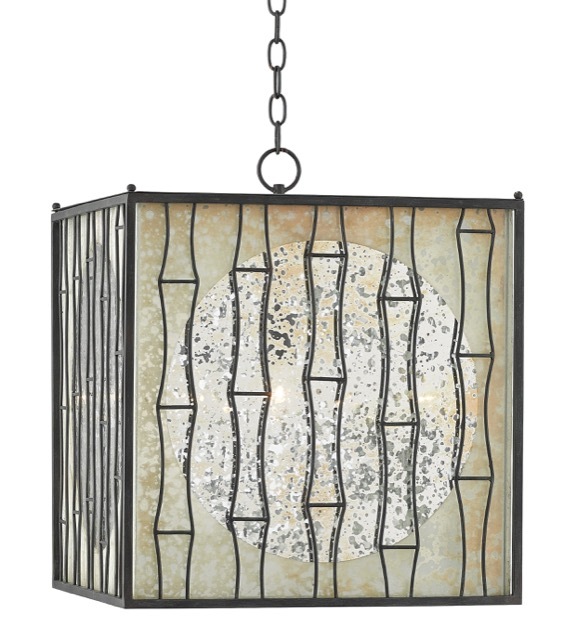 This entry was posted in Currey & Company, Entertaining, Market, Products and tagged cabinets, Chandeliers, design influencers, design trends, Events, Furniture, Lighting, Modern, organic shapes, Silver, Wall Sconce on November 16, 2016 by Currey & Company. Great to see some of the highlights recapped. Bravo Ms. TILLEY Green. Another intuitive fab capture of subject matter.